Canadian Para-Dressage riders overcame soaring temperatures to compete for Canada at the Rancho Murieta CPEDI 3*, held June 12-14 in Rancho Murieta, Calif.
Three riders, all hailing from British Columbia, competed for Canada throughout the weekend. Canadian Paralympian Jennifer McKenzie of Maple Ridge was the team veteran, with Tristiana Allwood of 100 Mile House, and Sarah Cummings of Cranbrook competing at the international level for the first time. 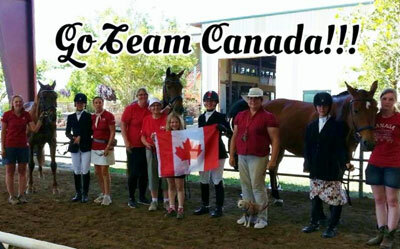 The riders were led by Para-Equestrian Canada (PEC) Chef d’Équipe, Elizabeth Quigg of Stouffville, Ont. After settling in at the beautiful Murieta Equestrian Center and completing the horse inspection, all three riders headed into competition on June 12. Despite dealing with a heat wave that settled on the Rancho Murieta area, McKenzie started off her weekend with a second place finish in the Grade II Team Test on a score of 64.216%. Her mount was the recently acquired Lexington Star Bright (OA Tango x Warn), an eight-year-old Warlander mare owned by Tammy Van Samang. The duo continued to earn second place ribbons across the division after scoring 60.952% in the Grade II Individual Test on June 13, and closing out with a score of 64.250% in the Freestyle on June 14. “I had a wonderful experience on a fantastic horse this weekend,” said McKenzie of her experience at Rancho Murieta, which marked her return to the CPEDI-level after having taken a few years off from competing internationally. Allwood and Cummings rode into the ring for their inaugural CPEDI 3* class on June 12. Paired with Rufus, a 17-year-old Thoroughbred gelding sire by Katahaaula County and owned by Sue Willis, Allwood rode to a score of 61.009% for third place. Cummings wasn’t far behind, taking fourth place aboard her 11-year-old Oldenburg mare, West Bay. “It was a big leap into international competition, but overall this was a good experience for me,” commented Cummings. The following day saw Allwood and Rufus add another third place to their collection, this time in the Grade III Individual Test with a score of 60.732%, while Cummings held her fourth place position with West Bay. On June 14, Allwood wrapped up her division with a third place finish in the Grade III Freestyle (58.583%).